Gum disease is an oral health condition, which affects even those who brush regularly. While people with poor oral hygiene are more likely to suffer from gum disease, improper brushing and flossing can also cause the condition. There are various other contributing factors than can cause gum disease, such as poor diet or smoking. When it comes to treating gum disease, your dentist will need to know your medical history, dietary habits and whether you smoke or not. It is important to divulge as much information as possible so that periodontal treatment has the greatest chance of success. Thorough cleaning is the first step in combating gum disease, then followed by scaling and root planing. We may also recommend a course of medicinal treatment as aftercare. If the condition persists or worsens, there are also surgical options available which can help address gum disease. Gums bleeding, swelling and becoming raw or painful, are all signs of gum disease. However, you may have gum disease without any obvious symptoms. During your comprehensive dental exam, at Kyle Parkway Dentistry, your dentist will check your gums for discoloration, swelling and other signs of gum disease. Catching the condition early will greatly improve the effectiveness of treatment. Gum disease is caused by a bacterial infection, which results in gingivitis. Gingivitis can be treated with proper brushing and flossing in mild cases. However, left unchecked, gingivitis can progress to periodontitis. Both conditions are essentially caused by poor oral hygiene and are exacerbated by smoking and certain dietary habits. 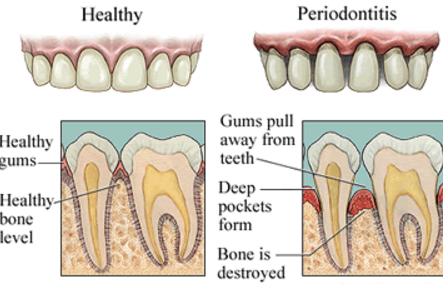 If you have concerns about periodontal (gum) disease, contact Kyle Parkway Dentistry today to schedule a consultation.